Collections are groups of sources built around a theme. Once a collection is created, you can change its name at any time. Important: Renaming a collection requires rebuilding all the sources contained in the collection. 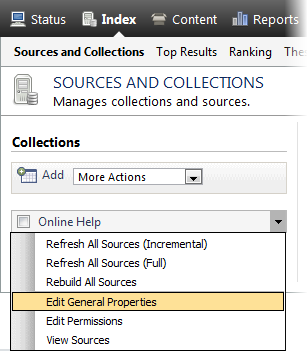 In the Collections section, expand the drop-down list of the collection for which you want to change the name, and then select Edit General Properties. In the right panel, under General, in the Name box, enter the new name for the collection. Note: Remember that this name may be visible by end-users in search interfaces. It will appear in optional Collection facets or collection check boxes below the search box, both allowing end-users to refine results by collection. Consequently, choose the name carefully so that it clearly describes the collection content from the end-user point of view. It is also a best practice to ensure that this name follows a similar naming convention as the name of other existing collections. In the Collections section, expand the drop-down list of the collection for which you want to change the name, and then select Rebuild All Sources. Open the CES Console to monitor rebuilding of the sources (see Using the CES Console).